Smash Bros. and diversity of game representation. Home › Forums › General discussion › Video Games › Smash Bros. and diversity of game representation. Tagged: Drill Dozer, Panel De Pon, Smash Bros. This topic contains 6 replies, has 6 voices, and was last updated by Kaosubaloo 4 years, 6 months ago. This is springing from the short back and forth Cap and I had on the article discussion for the recent Smash Bros. 4 character announcement update. I wanted to open up to the community: what games do you think are underrepresented? Who would be a good addition from said games? I would love to see a character from a “real” fighting game like Zangief show up. I wouldn’t mind more villains, Ridley, Nergal, etc. Ice Climbers was a unique playstyle, wouldn’t mind more of that. A stage based on NES Remix where stuff changes from different games. Also, an Excitebike assist to drive people off the screen. The problem with a character like Ridley is he has a generally particular look and movement style, as a player character he won’t be able to do a whole lot of flying around fast-like, and he’ll have to be scaled down (possibly redesigned to his NES days look) which could verymuch limit his move set. But I agree with the Ice Climbers and other similarly unique characters. Ridley and other boss characters are already going to appear in themed stages, where they can be fought. Rosalina and Luma have a similar playstyle to the Ice Climbers. Excitebike was already an assist trophy and I find it hard to believe it wouldn’t be again. I don’t think the game will be particularly starved for a diverse range of games being displayed. Between the characters and the assist trophies and the trophies and the stickers (should they return) and the stages and the enemies, most players of Smash Bros. get exposed to more games than even they are aware of. Smash Bros. is how I came to learn about and/or be a fan of Mother, Kirby, Metroid, F-Zero, Fire Emblem, Kid Icarus, Ice Climbers, Electroplankton, Animal Crossing, and a handful of other IPs that I wasn’t aware of. Rather than bemoan the addition of more characters from a series you’re unfamiliar with, why not take it as an opportunity to learn about the characters and play the games they star in? Besides which, at current count, there will likely only be four selectable characters from the Fire Emblem series anyway, and that’s no more than any other franchise has had in any other Smash Bros. The assist trophies are great because they do truly dig deep in the Nintendo grab bag. There’s a couple that I’d love to see graduate to full-fledged characters. Lip – You know the Smash Bros. item “Lip’s Stick”? The flower? That’s from this super cute fairy girl from Panel De Pon aka Tetris Attack. They’re WAY due to come back. They’d kill on both sides of the Pacific. 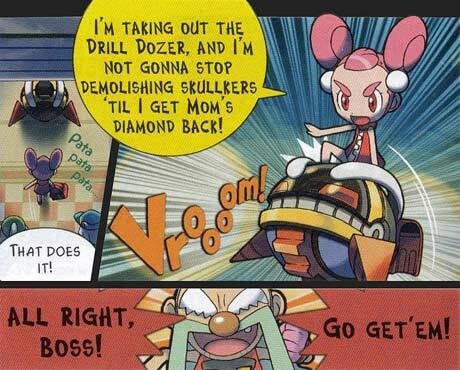 Jill Dozer – From Drill Dozer, one of the best games of the GBA era. A gorgeous and tactile platformer with a fun story and unique gameplay. She’s a jewel thief that rides around in a drill-armed mecha. The girl is practically born to be a Smash player, not just an assist. She, like Lip, is WAY past due for a comeback. The biggest loss would be no rumble (it was built into the cart) unless she jumps from portable to the Wii U.
I want to see Isaac. Or Felix. Or even Mathew. Look, the point is I want at least some sort of full Golden Sun representation.